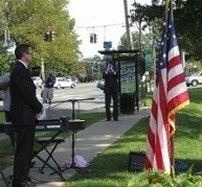 The People's 9/11Memorial Wall at Richard Presser Park on Central Avenue is complete! 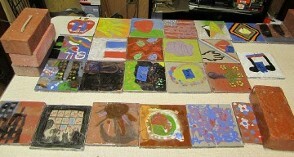 The tiles were created in workshops sponsored by ArtsWestchester with funds from Project Liberty. 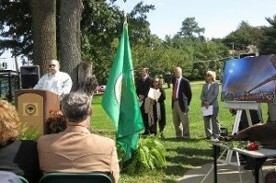 Rotary Clubs International secured financial support for the restoration project from Sam's Club/Walmart. 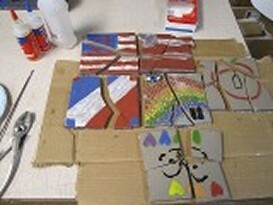 Photos below show broken and repaired tiles, some volunteers at work, the final lay-out and the rededication ceremony on 9/11/11. 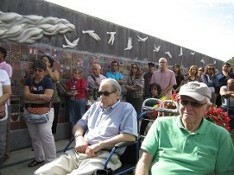 People’s 9/11 Memorial Wall Tile Restoration Project Completed! 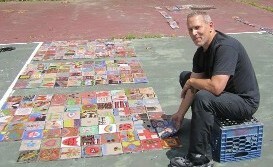 When I first agreed to manage the restoration of the tiles for the People’s 9/11 Memorial Wall in Greenburgh’s Richard Presser Park, I had no idea how much work was involved, even though I’d been told that almost 300 tiles were broken into multiple pieces, and only half of the remaining 1500+ tiles had numbers on them indicating where they belonged in the wall’s original pattern. 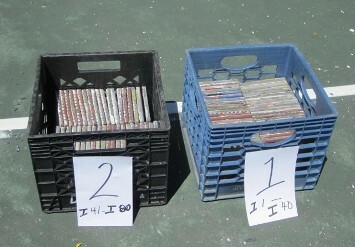 Upon first seeing the 44 crates of tiles stacked on a tennis court in AV Park, I experienced a sense of gloom and hopelessness! The job seemed impossible! What had I gotten myself into? Greenburgh Town Supervisor Paul Feiner, who had implored me to give the restoration my highest priority, immediately sent four of his Ardsley High School interns over to help. 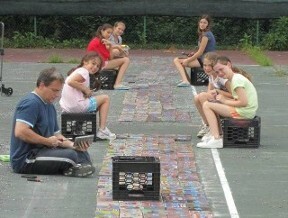 They unloaded tiles from the crates and begin to re-assemble the numbered parts of the puzzle. 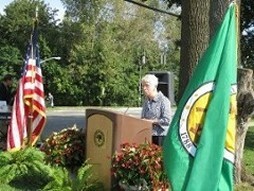 Soon, other people responded to Supervisor Feiner’s emails asking for volunteers. I slowly began to believe that the job could be accomplished. A meeting with Ron Mineo, the designer of the original wall, gave me some insight into how to maintain the integrity of the design, though I had fewer tiles. He also told me that it took him three weeks and four assistants to lay out the basic design. Ron and Luis Del Rosario, my liaison from Rotary International who secured funding from Sam’s Club/Walmart to pay a mason for the reinstallation, gave me color photos of the original wall and I began reconstructing the ten-row, 80-foot long design. I thought the job would take two weeks -- maximum. 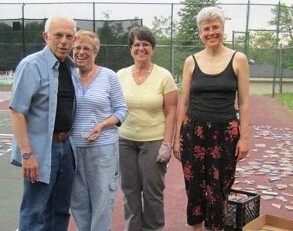 Five volunteers, who I dubbed “the Puzzlers” (Ilene and Harold Rose, Linda Beres, Anne Barshall and Judith Pollack), had other ideas when I said to ignore the crates of broken tiles because they were unsalvageable. Piece-by-piece, they matched more than 150 tiles. 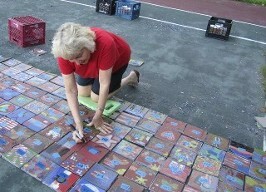 Judith Pollack and I took those tiles home, glued them with epoxy, then placed them back into the gigantic puzzle. The project suddenly began to take on mythic implications: maybe we couldn’t put the World Trade Center back up; but together, we could rebuild the People’s 9/11 Memorial Wall! 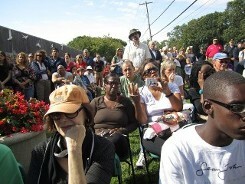 The Journal News did a story on the project and community groups called to ask about helping. Some, like Greenburgh’s Police Cadet Corps and Community Emergency Response Team, sent volunteers (young, middle aged and retirees) who helped. However, most groups wanted to work later in the summer, long after I expected the project to be finished. Humid, 90 degree days under a scorching sun plagued my first week of work. Sometimes, only one or two volunteers showed up. One day, when 16 volunteers showed up, a thunderstorm quickly ended work. Faithful volunteers like Rich Pacheco and Al Sarnotsky worked mornings. 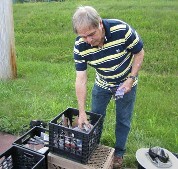 Other volunteers, with day-jobs, reported for the 5-8:30 pm shift. We plodded on, tile-by-tile. After reconstructing the original design, the next step was to number each of the 1,686 tiles in the puzzle and remove the old grout from them. Stormjames Lipton (an Eagle Scout who had just returned from a mission to South Dakota) rode his bike to the Park on several occasions and assisted with the arduous job of removing grout. The Denis family, who had a cabana at A.V. Park, came over and asked what we were doing. The next day, Jelani Denis returned with his grandmother Lucienne Bastien, and his cousin Cithera Hinds who both live in Brooklyn, but still wanted to help. Last week, when there were still more than 1,200 tiles with grout clinging to them, and no volunteers in sight, I was resigned to sending the incomplete job to the mason. A plaintive email (to people who had originally offered to help but had scheduling conflicts) produced Teresa Tomas of Hartsdale and her children. As soon as Teresa arrived and saw what needed to be done, she called friends. In a flash, the Estrellas, Nanhos and their children – and their children’s friends – showed up carrying pliers. They worked that evening until darkness fell. Not only did these nine children and four adults clean more than 900 tiles, they crated them for delivery back to the Wall! And all the while, they smiled and chatted like they were at a quilting bee. Some of the kids were not even born when 9/11 occurred; still, they diligently helped with what they admitted was “hard work.” They wanted to come back the next day to finish the job but a thunderstorm thwarted them. Finally, Monday evening, July 11th, Stormjames Lipton and I removed the last of the grout and crated up the final 240+ tiles. Almost five weeks after I began the restoration project, 1,686 cleaned, repaired and numbered tiles were ready for transport back to the Wall in Presser Park. The reconstruction of the People’s 9/11 Memorial Wall in Greenburgh is truly a testament to the civic-minded dedication of children and adults from our community. 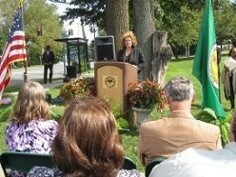 We are fortunate to have thoughtful individuals who recognize the value of hands-on contributions. 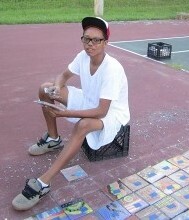 Tile-by-tile, the people of Greenburgh have reconstructed the tiles for the People’s 9/11 Memorial Wall. Now, they are being passed on to the mason. It will be his job to insure that they remain affixed forever. 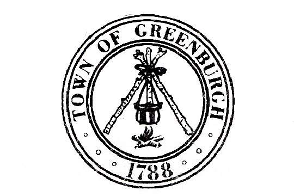 Visit “groups” on FaceBook, then go to “Greenburgh Arts and Culture Committee” to see more photographs of the project and its volunteers.